This great contribution is by my friend Raul Colon. Raúl J. Colón is Principal of CIMA IT Solutions Corp. , an IT Consulting & Social Marketing Firm, which helps small-to-medium sized organizations in implementing adequate business processes to meet their IT and Social Marketing business goals. I sometimes also call him Kitchen Table Talks “pet” 🙂 Follow him on Twitter @rj_c! I have been using foursquare for a good amount of time. Foursquare offers badges for different levels of customers which initially got me interested in playing along (How can Geo-Location Services Help Your Business?. Although the past few months I have been working more from home, while I am traveling I am consistently checking-in on foursquare at most locations. I have seen how people have caught up with using foursquare but it surprises me that more venues have not moved as quickly in creating an experience via foursquare. Not as many businesses sign up for an offer on foursquare but the few that do sometimes don’t create the experience their customers who are foursquare users are looking for. I remember reading @chrisbrogan’s “GO MAP YOURSELF” and understanding the difference in feeling like the real mayor of the venue or just being the foursquare virtual mayor. Why offer your customers a foursquare experience? Foursquare offers major visibility because every check in automatically reaches the network of the person that checked in. You might be able to put your Business name in front of hundreds or thousands with very little effort. It offers various and flexible ways of promoting your services, products, and mainly your locations. You can create virtual loyalty cards, give a bonus or upgrade on an item, boost traffic on slow days, create an incentive for 1st time visitors, create an incentive for repeat visitors, give out something unique, or even motivate people to bring their friends along. Educating your staff about the offers is a great start. I have had various experiences in which I have checked in for a foursquare offer at a few restaurants and I get a confused look from the waitress not understanding they have a foursquare offer. Educating your staff about offers is the most important part of the experience. Greet those who checked in on your location and thank them for checking in. For example if you are in the restaurant industry have your hostess or manager verify who has checked in and take a look at their avatars or pictures have them greet them. Remind them and apply the offer before they ask. This will create a completely different experience from having to tell the waitress or haggle with the manager to get was offered. If you are not able to identify the person via their avatar go ahead and send them a tweet thanking them for there visit and reminding them about the offer. Know your foursquare mayor. ;[I have been the mayor of many venues in which I have not been recognized being a repeat customer and holding the title of Mayor on Foursquare.] Adding the foursquare part meant I was promoting their business to my community and networks on LinkedIn, Facebook, and Twitter. Once you have done your research, make sure you give him some extra perks and teach your staff to recognize whom that person is. For those customers who don’t use foursquare, make sure you also show gratitude with offers for supporting and promoting your business. No matter what tools you use online or offline. If your business is actively promoting foursquare make sure they are really making your foursquare mayor feel like he is royalty. Creating a unique experience for those that support your business should be in every business plan. Any other suggestions on creating or enhancing your customer’s experience using Foursquare? Killer post. 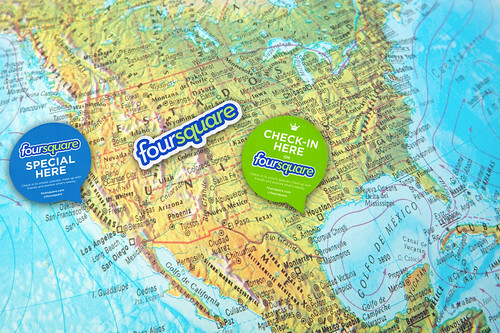 We’ve put a proposal together to test out foursquare with a few of our clients. Your insights, especially the one about knowing your mayor, are priceless. Let me ask a quick question – would we be off base in our thinking if we talked about the platform as one that rewards loyal and current customers versus attracting new clientele? Thanks for the compliments. I think it is key if you reward loyal customers since those are the backbone of every business but I would not close it off to only loyal customers. I have used Foursquare on most of my clients as a transmitter to find new customers at a close distance to get them interested in visiting my clients. Raul this is a great example of taking the check in experience one further. I love how you nailed this so effectively and creatively. It has given me ideas on how to fit geo location consulting into my consulting services. Also thanks for linking to my post on this topic as well. I think as a tag team approach we did a good job of showing people the value of geo location services. I want to thank Margie for allowing me to be part of this two part series.